Who am I? And What Am I Doing? It’s an interesting sensation to feel as if I am writing to no one, but at the same time, to feel as if everyone is waiting, watching, and I have to perform. So, I guess, let the curtains rise. 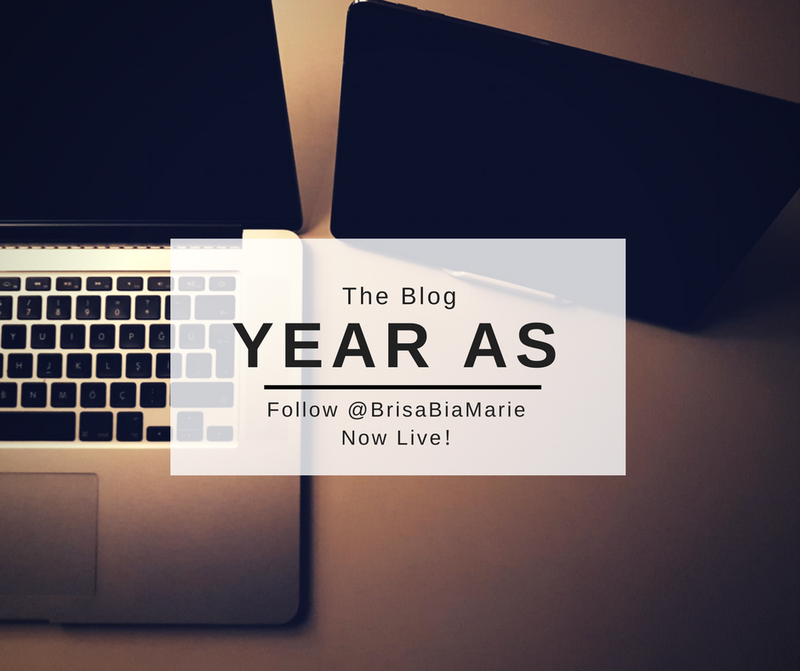 My name is Brisa Marie and I am the designer, marketer, and author of “Year As The Blog”. But before today, I was just a 23-year-old graduate student, who works endless low — to no — paying internships, loves matcha tea, and really wants to travel the world. So how did I get bit by this blogging bug? Well, it’s a combination of a lot of things that were happening in my life around the same time. First, I had just graduated from my undergrad, and felt really overwhelmed with the idea of getting a job and working there, every day, until I die. I know. Dramatic. But in a more down-to-earth perspective, I was just really stressed about being stuck in a place or position that I wasn’t in love with. So, I applied to grad school and got accepted! Which turned out to work out better than I thought, because I ended up getting an amazing internship in marketing and development. Which, just in case you’re wondering, I had no prior experience in. Then, I had a friend, Rachel, who was really into broadcast journalism and social media, and she was starting to build her digital persona and it seemed like so much fun! (Her website is RachelGTV.com, check it out. She’s quite cool.) So, I thought I should try out marketing myself and building a brand of my own. The only problem was, I had NO idea what I could focus on, so I put it off for months. My main problem with trying to start a blog, or even, building a brand was that I didn’t really have a brand. Just like when I thought about having just one job, I started to feel constrained. Creating a brand requires a level of focus, expertise or influence. I don’t really have any of those things. Also, I knew from all the articles and talks from real marketing professionals, no brand meant no market and no market meant no success. So, I really didn’t try. Luckily, I realized maybe my niche is that I don’t have a niche. I know, cliché, but it felt so right,not to mention, while they may be in the minority, other bloggers have been successful in diverse blog content. I used them as inspiration and eventually came up with the idea of “Year As”. So, what is “Year As”? Well, as you may have guessed, it’s a blog. Unlike other blogs, I am not here to offer expertise, advice or influence. I apologize but I quite literally have no idea what I am doing. But that’s okay because it’s kind of the point. “Year As” is a social experiment. It’s a blog that is asking the universe “what would happen if…?” What would happen if I did something I have never done before? What would happen if I put myself out there? I think we all ask ourselves these types of questions and sometimes we get answers and other times we make them up. I didn’t want to keep making up an answer because I was too afraid to look for it. I wanted to challenge myself to learn new things, to be fearless, to be brave and encourage others to do the same. I wanted to reinvent myself. Not just once, but every year for the rest of my life. What would happen if I started a blog that focused on recreating yourself every year? And so, “Year As The Blog” was born. Well that is a great question. I really do not have the perfect answer, but I can tell you what I am trying to do and how I hope to structure this blog. “Year As”, as the name suggests, is a yearlong journey, and though I want to be ambitious and say definitively, “I will post every week all year”, I also really want to be realistic. I’ll probably say this a billion times throughout the course of this blog, but I don’t know what I am doing. I don’t really understand the time commitment or research that goes into running a successful blog. I want to give you quality stuff, so I have decided I will do the following things. I will post on the 1st of the month every month for 12 months straight, these 1st of the month posts will be a check-up. I will describe my successes, my failures, my feelings, and if I can get any, a funny story or two. These posts will document how I am emotionally as I pursue learning to be a blogger month by month and hopefully they will invite comments, ideas, discussions and tips for me and any other readers that are feeling like I do. I will also post on the 15th of every month, these posts will be a reading list of sorts. It will be a way to have a lot of transparency with you. If I read a post from a well-known blogger that made me feel invincible then I will share it because I want you to feel invincible too! These lists will be short and have a little summary so you can focus on the ones that matter to you. Sometimes they may all be practical and about blogging but other times I might share a list of things that help me with other self-improvement goals. Because it’s important to me to stress, this is not a blog just for bloggers, this is a blog for self-improvers, self-lovers, and “good vibers”. While I am currently focusing on this whole blogging thing, you can be exploring your own journey. I want to be there to support you and I want to help by being an example. Because, hey, it’s hard to be vulnerable but you don’t have to be alone. Lastly, if I find myself doing something fun or maybe if I am just feeling chatty, I may publish a Bonus Blog. I haven’t really fleshed out the entire concept of a Bonus Blog, but I feel like, what the hay? I have a website why not add extra content? With all of this said please, please, please if you want to follow my journey, like my Facebook page and/or follow my Twitter. I post articles and updates about my blog on these platforms, plus some cute quotes with my face in the background. Regarding my website. This is also my first time working with WordPress, so if there are bugs, glitches or typos, feel free to use my contact page and notify me. I will fix it as soon as I figure out how. Also, I realize some of you may see some annoying ads at the bottom of my posts. Do not let that bother you, I plan on upgrading my website soon, so please bear with me. Well there it is. My first blog ever. I enjoyed writing it and feel a lot less stressed now that I have my thoughts written down. If you are starting your own journey or just want to say hi, leave a comment below. If you enjoyed reading this post, share “Year As” with your friends, family, or even your pets. And if you haven’t already, follow my blog and social media to join me as I explore this year as a blogger.